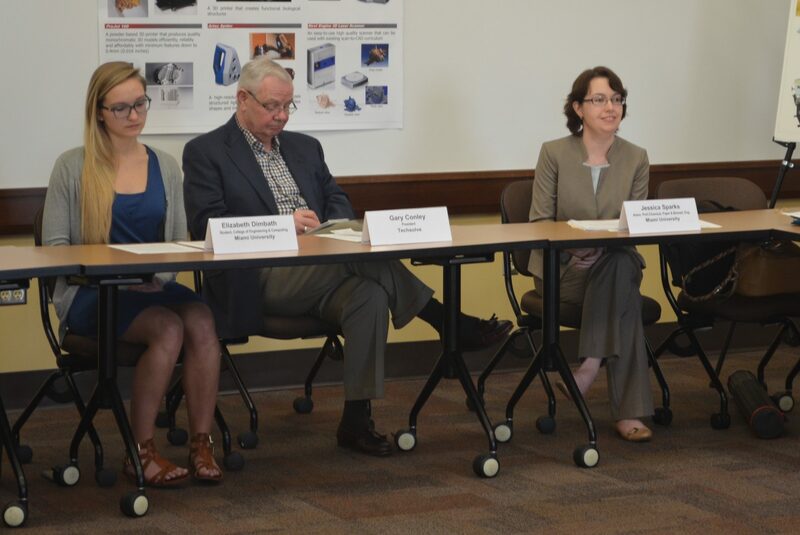 Dr. Jessica Sparks, right, at a press conference announcing award of $1 million to Southwest Ohio Regional Consortium. Miami University brought in a total of $23.1 million in extramural funding during the 2016 fiscal year, up 23% over the previous year. We saw increases across the board, from all sources — public and private — with standout growth of 75% in funding awarded by the state of Ohio. 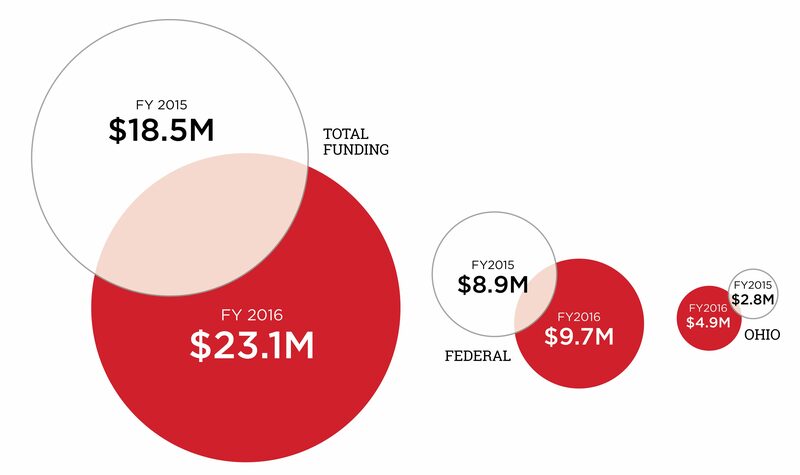 FY2016 total, federal, and state funding compared to FY2015. Rick Page, an assistant professor of chemistry and biochemistry was recognized as one of the nation’s top young faculty in his field by the National Science Foundation (NSF) with the award of a CAREER grant. He will receive more than $920,000 of research funding over five years for his esearch on quality control in proteins. Read more here. Associate professors Amy Summerville (psychology) and Jennifer Blue (physics) and College of Engineering and Computing administrator Brian Kirkmeyer are working to develop an intervention to improve the success of engineering students in early physics classes. The project is supported by a $368,000 grant from the NSF. Read more here. Haifei Shi, an associate professor of biology, is exploring the potential for brain-derived neurotrophic factor to be used in therapeutic treatments for obesity, a major risk factor for the development of cardiovascular disease. Shi’s work is supported by a $390,150 grant from a division of the National Institutes of Health (NIH). Read more here. Phyllis Cummins, a senior research scholar in the Scripps Gerontology Center, and a team of colleagues are working to identify patterns that suggest successful approaches to educating students 40 and older. Their work is supported by a $1.4 million grant from the U.S. Department of Education’s Institute of Education Sciences (IES). Read more here. The NSF’s Robert Noyce Scholarship Program awarded $74,956 to a team led by Nazan Bautista, an associate professor of teacher education. The team is working to help STEM majors, STEM professionals, and STEM teacher ed majors gain the skills necessary to teach in ethnically and culturally diverse communities. Read more here. As a member of the Southwest Ohio Regional Consortium, Miami is sharing $1 million awarded through Ohio’s RAPIDS program. Miami’s $381,856 share will purchase additive manufacturing and 3-D scanning equipment. The grant is administered by a team led by Jessica Sparks, an associate professor of biomedical engineering. Read more here. The Ohio Department of Education has awarded a grant of $93,242 to Susan Hershberger, director of the Center for Chemistry Education, Jennifer Blue, an associate professor of physics, and Tammy Schwartz, director of the Urban Teaching Cohort, for a project that provides professional development for Ohio 6th to 8th grade educators in partnership with Middletown City Schools. Read more here. The researchers and scholars mentioned here — along with dozens of others at Miami — involve students at every step of their research. In fact, the synergy between Miami’s undergraduate students and the graduate students and faculty who mentor them is at the heart of the Miami Experience. Many undergraduate students at Miami get hands-on experience with equipment and techniques that only faculty and graduate students get at other institutions. This unusual level of access also benefits our graduate students, who have the opportunity to teach these techniques and the proper use of this equipment, while helping to shape the next generation of researchers through their mentorship. 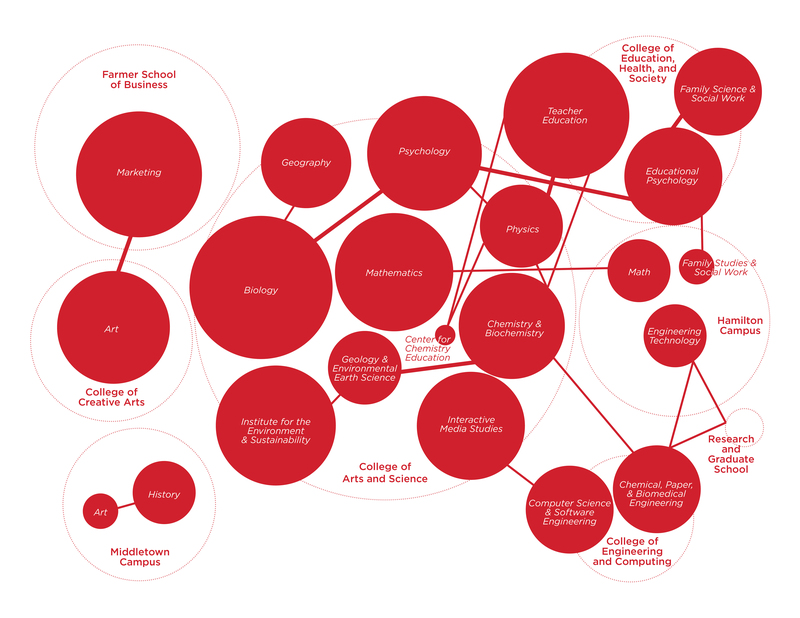 FY2016 interdisciplinary collaborations between departments and colleges (bigger circle = more faculty in unit; thicker line = greater number of collaborations). The result is an exceptional learning environment that has earned Miami University global recognition. We remain dedicated to helping the Miami community find and secure the funding that makes it possible. You can see the full report on FY2016 extramural funding here. Written by Jim Oris, Associate Provost of Research and Scholarship, Miami University. This entry was posted in Funding report, OARS news and events and tagged extramural funding, funding. Bookmark the permalink.